Gnostice PDFOne .NET is a versatile PDF component suite for .NET developers to implement PDF-related tasks in their applications. PDFOne .NET can create, edit, view, print, search, redact, encrypt, decrypt, digitally sign, merge, split, reorganize, bookmark, annotate, watermark, and stamp PDF documents. PDFOne .NET can also create, edit, delete, fill and flatten PDF form fields. It also has an AJAX-powered Web-Forms PDF viewer component that can display and print PDF documents on any modern browser. PDFOne .NET is based entirely on managed code. 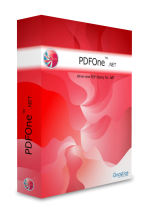 PDFOne .NET does all of this without any external PDF software such as Adobe PDF library, Adobe Acrobat Professional or Ghostscript. PDFOne .NET can be used with C#, VB.NET, ASP.NET and other .NET development platforms. PDFOne components come with hundreds of functions and properties that put immense power in the hands of the developer. They hide the complexity of the PDF format and allows developers to quickly implement PDF-related features. For complete peace of mind and unmatched value for money, buy our "all-.NET-products-included" Gnostice DevSystem .NET Subscription. You get 12 months free major and minor updates and priority e-mail support. Upload your PDF documents and view it online in the Web Forms PDF Viewer. Upload your PDF documents and view it online in the MVC PDF Viewer Extension. * - The PDF viewer components for ASP.NET are supported only in Visual Studio 2010/2012/2013/2015. Support for images using "Separation" colorspace with alternate "Lab" colorspace and "tint" transform functions. Support for stencil masking for 8-bpc DCT grayscale images. WriteText() methods fail to specify appropriate encoding for some Unicode text. AccessViolationException thrown while creating object of PDFImage in an ASP.NET application. FontList.XML file generation omits font files with extension in upper case. Issues in loading some documents because of free objects in the XREF table. First page becomes blank when loading and saving some encrypted PDF documents. Some text elements are not rendered when white-space characters precede their encoding in the PDF. Check marks of some form fields are not correct. Default mask is applied to all rendered images. InvalidCastException encountered sometimes when image dictionary attributes are referred using "IndirectReference" objects. Type-1 images with CMYK colorspace are not rendered correctly when valid colors are not specified. Dots are not rendered if "move to" and "line to" points are the same. Setup program will install separate sets of DLLs for .NET Framework 2 and .NET Framework 4. PDFFont.SizeInPoints property is no longer read-only and can be set by user code to change the font size of a PDFFont instance. Creation of PDFFont instances was slow - FontList.xml gets re-created each time. Highlight markup annotations hides page elements below the highlight content. Some documents are not loaded because of incorrect processing of some unusual delimiters in cross-reference table. After form field modification, form fields without default appearance become invisible. Shape-drawing methods ignore page crop box. Introduced PDFFormFieldActionType.None enum member and made it default action for PDFFormPushButton class. Some text written using Adobe Gothic CID font are not displayed. 8-bpc-color images with "color key" masking are not displayed with proper masking. Incomplete loading of document if "startxref" is not at offset 0 - fault tolerance added to match Adobe Reader behavior. Inability to decrypt some PDF documents encrypted with AES encryption - incorrect processing of "null bytes" padding of password. Font engine performance is slower in non-English locales. "Array index out of bounds" exception encountered - "Size" entry is less than 1 in cross-reference table trailer. Text redaction method does not write replacement text in original font - name of original font contains junk characters. PDFDocument component locks file when loading documents. Enables viewing and printing of PDF documents in ASP.NET MVC web applications. Load PDF from files and streams. Get page number and page count of loaded PDF document. 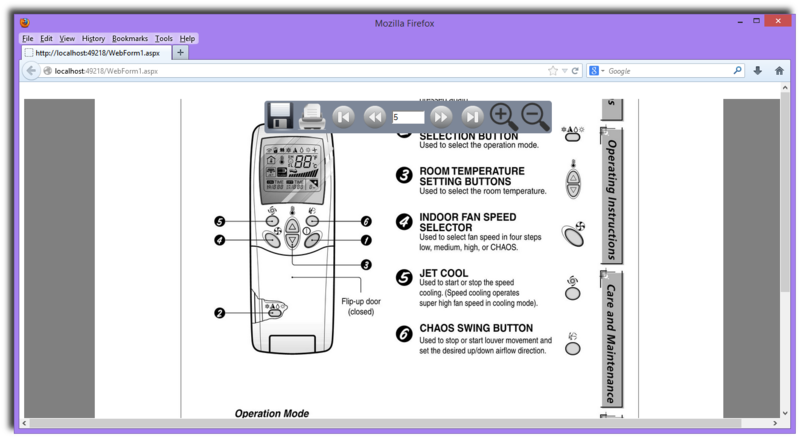 Call methods to navigate pages, save PDF document, print PDF document, zoom in and zoom out. Listen to add_PageChanged event to handle current-page change events. Choose type of page elements that need to be rendered. Enable/disable rendering of interactive page elements (form fields and annotations) based on their attributes. Print images in color or monochrome. Added new overloads of GetPageMetafile(), RenderOnGraphics(), and SaveAsImage() methods in PDFDocument class. Added Measurement unit property to PDFAnnots and PDFFormfields classes to avoid ambiguity. PDFDocument.GetAttachments() now returns a list of PDFFileAttachment instances instead of just stream instances. Optimized loading and more fault tolerance. Added ViewerPreferences property to PDFViewer control and PrinterPreferences to PDFPrinter - work similar to Preferences property in PDFDocument class. Parts of content are not printed with some documents when they are printed in landscape mode. Masked DCT Flate decode images are not rendered properly. Text is rendered with improper spacing when it uses non-embedded TrueType font for which "widths array" is not given in the PDF. Improper character positioning in some underline fonts. 8-bpc images in some documents are rendered transparent even when they do not specify any transparency. Text is not displayed correctly when an illegal character (a number) is found in its internal PDF encoding. Flattening of a multi-line text field with PDFAppearance.RecreateAlways or PDFAppearance.CreateIfNotFound setting causes the text lines to be rendered above one another. Words do not wrap in multi-line text fields when rendered or after form-flattening. In some documents, flattening of choice fields results in blank fields. PDFSignature field uses default font instead of the specified font. Issues in adding PDFSignature field to a page. Some PDF documents with wrong offsets initiate infinite loop and ends in an exception. Font size and autoSizeFont properties of text fields are incorrectly read. When loading some documents, some pages are omitted. Bookmarks without a title text throw exception during document merging. Issues in parsing Object streams when loading some documents. Form field and annotation properties are not set using their assigned measurement unit. Added dialog box for obtaining document password from the end-user. Added ViewerPreferences.Password.ShowDialog property to enable/disable password dialog box. Added ViewerPreferences.Password.AttemptCount property to customize the maximum number of permitted password attempts for the end-user. Added new PDFCell constructor to specify column-spanning, row-spanning and stroking pen..
Added new PDFTable.AddCell() overload with a PDFCell parameter. PDF Page quality on viewer improved for non-embedded font PDF documents. Rendering PDF document on web viewer viewing performance improved. 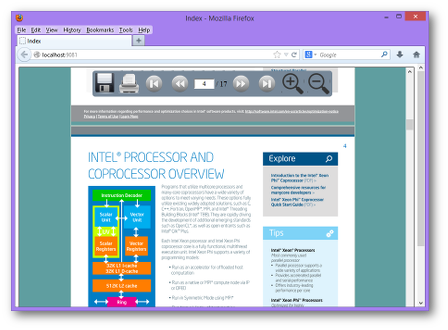 Optimized printing PDF document performance on client browser. When printing, starting and end points of some characters were unexpectedly joined by a line. Shapes are not filled based on current fill settings. Document file gets locked when it is being read. After auto-pagination, the cursor position for textouts is not reset in the new page. Empty signature are not handled. Form fields whose visibility is false are not read. Exception occurs reading page whose media box is null. Incorrect reading, encoding and setting visibility flags of all kinds of annotations. Text overflows and gets clipped when a new page is created by auto-pagination. Table width is not set using specified measurement unit. PDF loading sometimes goes into infinite loop. Load documents from files, streams, byte arrays, or a PDFDocument instance. Optional customizable user-friendly floating toolbar with buttons for saving, printing, navigating and other operations and for displaying page number and page count. Event support to specify password for decrypting encrypted document. Add your own client-side interaction and processing. Attach to add_PageChanged event to get notified when current page changes. CCITT4 encoding performance is improved. PDFDocument.AddPage() method has been optimized. Added new overloads PDFDocument.RenderOnGraphics with parameter to specify pixel density. Zooming issue related to zoom type "fit page" and "fit width"
Characters not available in the embedded font are not displayed. Exception thrown when PDFAppearance.RecreateAlways is passed to PDFDocument.FlattenFormField(PDFFormField,PDFAppearance) for document with multi-line text form fields. "Out of memory exception" sometimes occur in Web applications. PDFPage.Clone() fails to clone header and footer. Transparency applied to images without a transparency. Reading existing document locks the file. Hidden form fields and annotations are set to be displayed when a document is saved. Documents that do not have a "startxref" section are not displayed. Splitting leaves the last output document wrongly named - splitting a 10-page document by 3 pages results in one of the documents having a suffix "10-12" instead of just "10"
Landscape printing issue when AutoRotate property of printer component is set to true. Ability to set rotation angle for a page. ExtractPagesTo method sometimes causes "Object Reference not set to an instance of object" error. PDFLineAnnot constructor with LineColor parameter did not set the line color. "Invalid font stream" error when specifying font names with wrong case. New HScrollBar and VScrollBar in PDF viewer component for controlling the visibility of the scrollbars. New RenderingOptions property in PDF viewer and printer components to toggle the smoothness of lines, images and text, and to refresh the viewer when one of these settings are changed. BeforeCreatePage event called even when a default new page is created for a new PDFDocument instance. In some Windows regional settings, page elements are rendered with wrong colorspace. Multiline values of text fields rendered in a single line. Rendering of incorrectly encoded inline images. Memory leaks in the use of font processor library. Incorrect rendering of soft-masked images in some documents. Rotated form fields in rotated page not rendered properly rotated and positioned. Rotated form fields are not created correctly. Text wrapping by PDFDocument.WriteText(String,Single,Single) does not maintain original x-coordinate when beginning the new line on a new page (generated by autopagination). Creation Date document information property value not retained when document is modified. Support for rendering form fields without appearance streams. Support for constructing an appearance stream and then rendering form fields when PDFDocument.NeedAppearances is set to true. Support for tiling patterns in fill and stroke properties of path elements. Form fields in different locales not rendered properly. Text using Symbolic font with WinAnsiEncoded encoding rendered as square boxes. In some documents, Courier New font text is rendered using MS Sans Serif if Serif font flag is true. Font reuse issues with some documents while saving. Issues in reading of Rectangle property of annotations in a rotated page. SelectedItemIndex property of PDFFormComboBox always returned a value of 1. In some documents, document information did not get updated. Multi-line values of text fields were not shown in separate lines. Date document information property is not parsed properly. "Catalog is not a dictionary" error while loading a few documents. Simplified deployment steps for 64-bit & 32-bit machines using single set of PDFOne .NET assemblies. Refer Deployment topic of help file (API Reference) for details. Enhanced fault tolerance for reading PDF files with invalid object count in trailer section. Issue with NullReferenceException & AccessViolationException during Dispose under WebServices environment. Issue with wrong PDF encoding during successive load and close operations. Issue with corrupt PDF file generation after Stitch operation. Issue with encoding some ANSI characters with Acute, Grave etc. using WriteText methods. Issue with content encoding for some PDF documents with CropBox entries. CMap parsing errors for CID fonts during text rendering. Text rendering issues with CID fonts having single / double byte characters. Issues with rendering modes for very small size text (less than 2 points). Issue with string parsing to get the value irrespective of the Locale set. Support for 64-bit OS, for all the components. New BeforeCreatePage event for handling changes to page properties (size & margins) during autopagination using WriteText methods. New PDFBookmark properties - DestZoom, DestLeft, DestRight, DestTop, DestBottom & DestDisplayOption - to retrieve details of bookmark destination. Speed and memory optimizations during loading PDF documents. Enhanced PDFDocument component (Professional edition only) allowing Web applications to run under Medium trust level. New RenderError event to capture errors during rendering process. All new rendering logic rewritten completely in .NET (excluding FreeType Font processor DLLs). New GetPageMetafile method to retrieve the page contents as System.Drawing.Imaging.Metafile object. Enhanced image rendering logic for various types of images. New PDFDocument property to load existing object instance. New Password property to load from PDFDocument object for encrypted PDF files. New CloseDocument method overload with option to dispose the related PDFDocument object. New LoadDocument method overloads with byte array as input. New PageChanged event to notify change of page in Viewer (during scrolling). New ZoomChanged event to notify the changes in ZoomPercent in Viewer. New PageMouseActivity event to notify information about mouse activity on a PDF page. New RefreshView method to reload PDFViewer from associated PDFDocument after modification. All new 100% .NET component for loading PDF documents. Support for Unicode bookmark titles. Enhanced Viewer interactivity for navigating through the PDF with Named Destinations (Names Tree). ViewerErrors enumeration removed. Exceptions are thrown using PDFViewerException class. Delegate 'Gnostice.PDFOne.Windows.PDFViewer.PasswordRequiredHandler' is replaced by delegate 'Gnostice.PDFOne.PasswordRequiredEventHandler'. CloseDocument method does not return any value. GetPageMetafileStream method removed. Use PDFDocument.GetPageMetafile method. GoToPage method overloads return integer representing current page number after the go-to operation. BookmarskErrors enumeration removed. Exceptions are thrown using PDFBookmarksException class. Delegate 'Gnostice.PDFOne.Windows.PDFBookmarks.PasswordRequiredHandler' is replaced by delegate 'Gnostice.PDFOne.PasswordRequiredEventHandler'. PrinterErrors enumeration removed. Exceptions are thrown using PDFPrinterException class. Delegate 'Gnostice.PDFOne.PDFPrinter.PasswordRequiredHandler' is replaced by delegate 'Gnostice.PDFOne.PasswordRequiredEventHandler'. Print method does not return any value. Issue with character widths for different TextOuts using same font, but on different pages. Issue with text rendering for text containing new-line character (\n). NullReferenceException issue for some WriteWatermarkText overloads. Invalid Object Exception issue with reading Named Destinations in PDF Bookmarks. InvalidTypecastException during reading of PDF Info Dictionary. Issue with encoding xref stream for PDF V1.5. InvalidOctalNumber exception issue while reading certain PDF files. Issue with multiple filters for content streams in PDF files. Issue with left-top view during Zoom change. Rendering speed-up for PDF files containing images. Smooth rendering of images - appreciable when raster images are scaled to a smaller or larger size than the original. New AutoRotate property to intelligently rotate each page to suit the printer orientation and current page size. New AutoCenter property to automatically center the page on the printed paper. Support for adding formfields to rotated PDF pages. New GetAllBaseFontNames() method to retrieve all font names used in PDF. Infinite loop issue during saving PDF (certain files only). ArgumentNullException during saving encrypted document to byte array. Issue with loading PDF when Encrypt dictionary is null. "Index out of range" issue with parsing certain PDF files. Invalid type cast from "PDFIndirectReference" to "PDFName" issue. Issue with CID type embedded fonts when using GetAllEmbededFontNames() method. Image stretching issue when using DrawImage() method. Issue with page measurement unit when using GetPage method. "Page number out of range" exception during saving of PDF after DeletePages method call. Issue with ExtractPagesTo method increasing PDF file size due to invalid page references. NullReferenceException issue with Type1 fonts during merging. Issue with GetAllFormFields overloads regarding saving the modified Formfields. Issue with TextFormField appearence stream. Issue with page resizing using SetWidth, SetHeight for rotated pages. Support for rotated pages in PDF documents (Landscape & Portrait). New OffsetHardMargins property in PDFPrinter component, for shifting page contents to left and top, overriding printer's hard margins. Latest version of Ionic.Zlib.dll used. New SubmitActionType property in PDFFormPushButton class for handling FDF, HTTP-GET & HTTP-POST formats during form submission. Incorrect handling of printer's HardMargins during printing. Form fields showing values multiple times. Issue with adding annotations to rotated pages. File locking issue during loading of corrupt PDF files. Loading PDF documents containing PDF comments. Issue with parsing 'PDF Name' Objects containing '#' characters. Issue with loading of documents containing bookmarks with invalid destinations. Exceptions during multiple calls to ExtractPagesTo() & Split() methods. Writing of rotation value for un-rotated (Rotation=0 degree) form fields. Some third-party PDF to TIFF conversion tool had problems loading files with un-rotated form fields where rotation was set to zero. Loading PDF files with corrupt Document Information (Document Information will now be ignored in such cases). New ShowPrintStatus property to enable/disable the print status dialog. New overloaded Print method for specifying the name displayed for a document, say, in print queue or print status dialog. ChangePaperSource event for changing printer trays for different pages in the same print job. New ExpandBookmarksToLevel property for setting the default level to which the bookmark tree is expanded. New property ExpandAllBookmarks for expanding the entire bookmark tree by default. New property PageNumber in PDFBookmark for obtaining the number of the linked page. 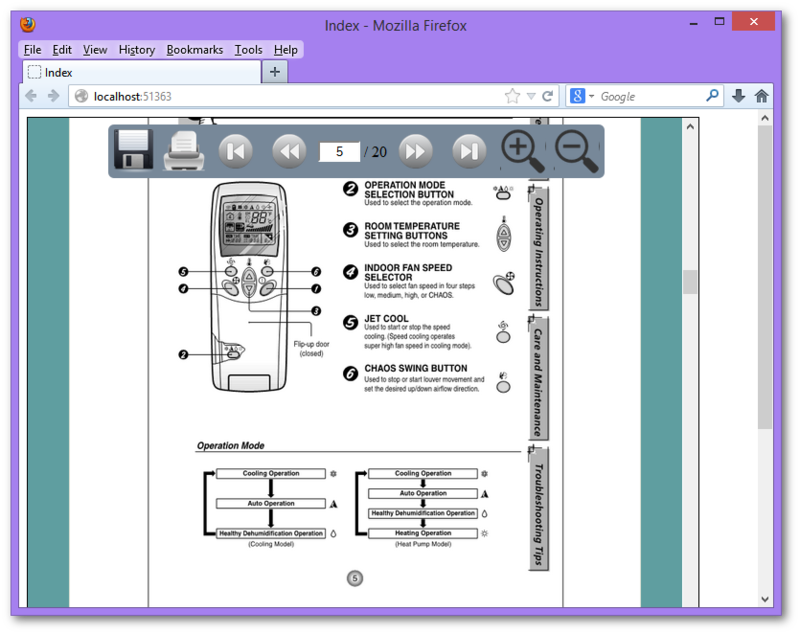 PDFViewer, PDFPrinter and PDFBookmarks components under 120 DPI screen resolution. Using default zoom for newly opened documents. Retaining zoom after a minimize-and-then-restore operation - interference by Windows UI animation. Correct clipping of page contents when no scaling is specified. Parsing open-ended page range properties, such as "-3" and "7-". 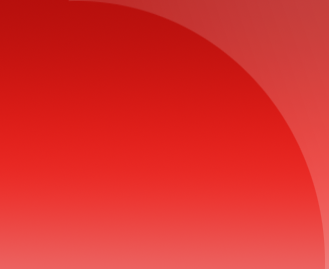 Rendering of headers and footers when shapes are added to the page - incorrect clipping. Using system font resources in a 64-bit environment. Rendering of new text using a CID font that is already used in the document. New overloaded LoadDocument() method in viewer, printer, and bookmarks components for loading a document (returned by new GetDocumentHandle() method) already loaded by one of the other components. PDFDocument is 64-bit OS compatible. For older releases of PDFOne .NET, please click here. A PDFOne .NET developer subscription comes with free priority e-mail support for 12 months. Please send your queries to support at gnostice.com. Please ensure that your mail system does not block e-mail from our domain gnostice.com. (Our support system will send you an autoresponder within a few minutes of your e-mail.) You can also use our online feedback form to send us support queries. A PDFOne .NET developer subscription comes with free updates (major and minor) for 12 months. Our news page provides information on the latest updates to our products. You can also subscribe to our news RSS feed to get notified of the latest updates. The installer application will also create a local copy in your computer when you run it.